It is no secret that my love for creativity in the kitchen has spiralled out of control, in a beautiful way of course. However, at this moment in my life, I feel I cannot eat food nor cook it like a normal person anymore, I refuse to settle for either, something I have already made, or something that hasn't involved some form of invention and beauty. I can't stop, it is an addiction. The feeling that I get from inventing, creating, designing and developing ideas, which simply come from gazing at my ingredients and my surrounding, not just objects but feelings aside, emotions that are propelling me into this wonderland...that in hindsight, I have no idea where it will all lead. I suppose that is the beauty of this passion of mine, I lose myself in it all, to me it is a drug, not only does it make me ever so happy, but I am putting smiles on other people's faces which is priceless. What's more, I am inspiring them and in turn they inspire me because without them, this would all be worthless. So here I am at 1am...plot lost. The pasta is boiling and I have my miniature fried egg pan on the stove with oil sizzling away (thanks for that mum it really is a nifty little saucepan). As I rush around my kitchen trying to make this crazy little idea come together in a matter of minutes, before the spaghetti is ready to be served, my phone rings. It's Ovi, who I recently acclaimed as a much appreciated, talented foodie friend plus, I figure, a slightly if not borderline eccentric like me. I mean you shouldn't even ask why he was out picking wheat in the wilderness at 1am.. I guess I am not the only one. LOL. 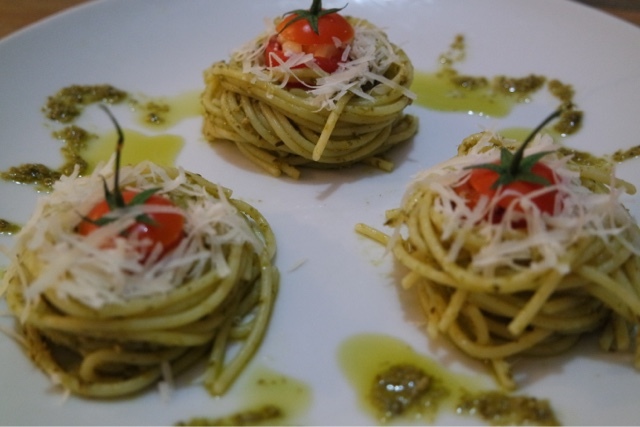 Then suddenly I realise, I am quite literally (with my phone in my ear pressed against my shoulder) picking up these oily strands of pesto smothered spaghetti with my CLEAN, bare hands and placing them on my plate in pretty little nests. In I popped the little tomatoes, well equipped with their hats. So how do you find yourself in this situation at 1am? - it's late...don't cook something now you'll be up all night then you will be full when you go to sleep, and as my mother always told me DONT EAT PAST 7....already done. 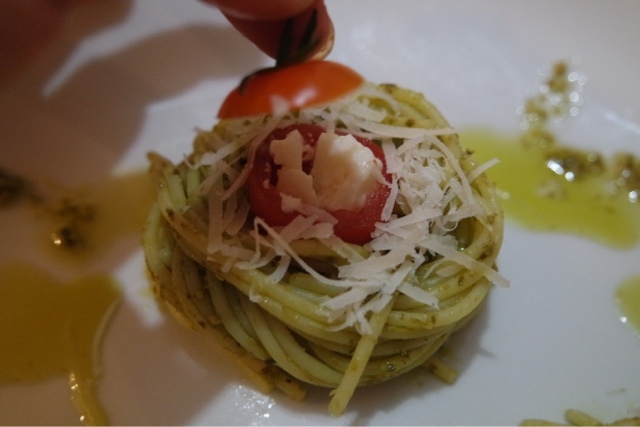 ♥ Chop the hats of the cherry tomato's and using a knife, delicately cut out their insides. No this is not the operating table, how dare I make it sound like one. ♥ Place a small bit of Feta cheese inside each and every tomato and place in a small saucepan with 1/2 tsp olive oil. 'place' sounds so delicate...just shove it in...JK please don't, this part really is delicate, you want the tomatoes to stand up so that the cheese doesn't spill out. DID YOU KNOW: Cooking tomato's boosts the antioxidant power and enhances their nutritional value by increasing the lycopene content that can be absorbed by our body. Oh and it changes the flavour! 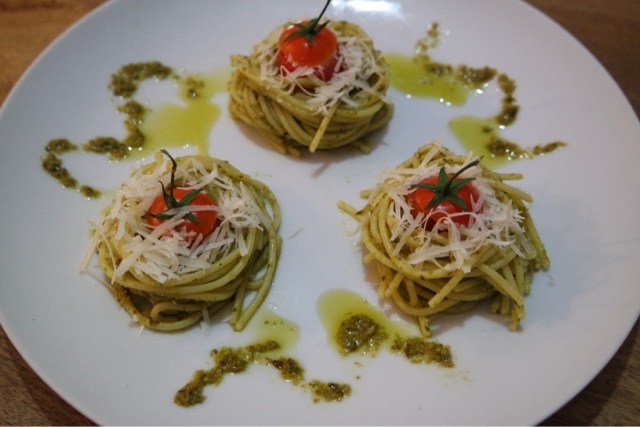 ♥ Drain the spaghetti, mix in the pesto. 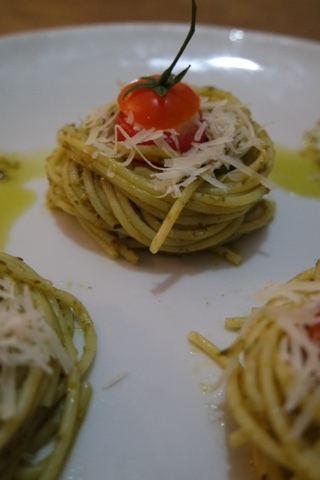 Picking up the pasta in your hands, swirl the strands in handfuls on a plate 3 times in order to create 3 nests. ♥ Place the tomato's inside the nests and cover with each of their hats. ♥ Sprinkle some freshly grated parmigiano on top and serve with salt and pepper.